Now into the start of the second year of tracking our net worth, and we had yet another increase. For the 5th consecutive month (starting in January of this year) we have grown our net worth. Our net worth has grown by 25.8% since our first report back in March, 2015! That is an increase of over $100,000 in just 2+ years. It is an awesome feeling knowing we are growing our net worth by thousands and thousands of dollars every single year! So how did we do this May? 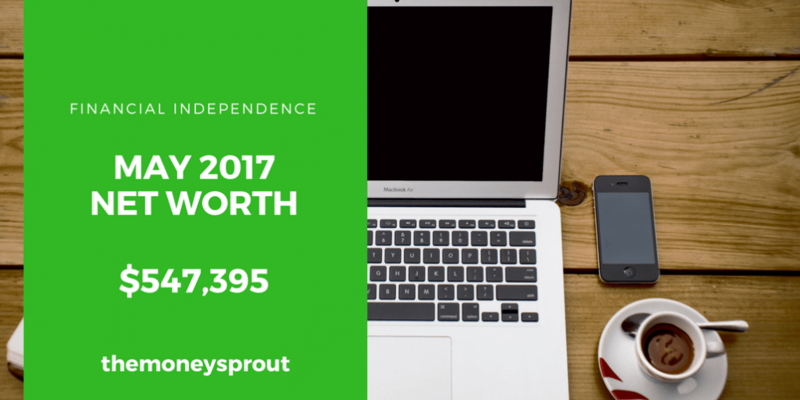 As of May 22nd, 2017 – our net worth is $547,395.21! In the past, we didn’t want to post net worth updates every month. Instead we opted for posting updates every quarter or so. Since there are so many moving parts to calculating ones net worth, it seemed pointless to go through the exercise every month. Well, things change … and now we plan to provide an update every month. We started providing monthly updates at the start of 2017 and plan to continue for some time. Here is our most recent update, compared to our last net worth post in April. Our net worth in May 2017 increased by a modest 1.1% compared to April (2017). That is an increase of almost $6,000 in just 1 month. This month, the the majority of the increase was from our investments … which has been very common lately. In addition to investment increases, we were able to decrease our liabilities at a decent rate, which is just as important as growing our assets. We currently have 3 main asset categories that we are reporting on – investments, cash, and home value. We don’t like to report our automobiles as an asset, so those are only included as liabilities. If we really wanted to get detailed, I should probably start thinking about adding these assets in the future. Investment increases made up the majority of our overall net worth increase last month. We have been investing a lot of new money over the past 7 to 8 months and are starting to see these assets grow … and generate income on it’s own. The value of our investments rose by 0.97%. Overall, the health of our portfolio looks strong as we have built a solid cash flow machine. Since the holiday’s were over back in December/January …. we have been trying to increase our cash balance. We slowly have been building it back up to a point where we are comfortable. I have never been a big fan of reporting on our home value in our net worth. However, it is one of our largest assets so we need to include it. A nice tiny increase in our home value … although it doesn’t really mean a whole lot at this point. Despite the limitations of reporting our home value, it is good to see the perceived value of our home increasing a little each time we report our net worth. Overall, all 3 of our assets that we report on saw increases. Investments really helped to push our net worth higher this past month! Total assets rose by almost 0.64% since last reporting. The last category is our car loan(s). We just took on more debt back in January, when I purchased a new car. As far as our other “family car”, we have a very low rate and are on year #4 of the loan. We refer to this as “car loan #1”. Since our rate is 1.56%, we haven’t paid too much extra on it. Based on the timing of these net worth reports, we didn’t make our May payment on car loan #1 yet. Next month should see a sizeable drop. Our credit card balances fluctuate a lot month to month. However, we are really focused on spending less. Lower credit card balance is a good sign our plan is working. We have been focused on saving (and investing), which will result in lower credit card balances. We also saw a drop in our car loan debt as well as our credit card spending. Look at how much our liabilities dropped in just one month! That is actually $3 more than our monthly mortgage payment. So basically we reduced our long term debt the equivalent of a house payment … which is pretty cool stuff. I never like to see our liabilities increase. Over the last month, we have lowered our liabilities by (0.51)% … which is a good thing. As I like to point out every time we talk about net worth … there are 2 sides to the equation. So a decrease in liabilities by ~$1,000+ is just as important as increasing our assets by the same amount. After reviewing our net worth number for this May, most of our gains came from investments. However, that doesn’t really tell the whole story. We were able to lower our liabilities by over $1,000 which is great. If we were able to maintain that rate every month, we could increase our net worth by $12,000 for the year! In addition to lowering our debt, we were able to save a little more money last month and bump our cash balance up. Plus the estimated value of our home increased a bit … although we don’t get that excited about those numbers.